I have had two ChE-related jobs since I graduated from college and then some part time job on the side. 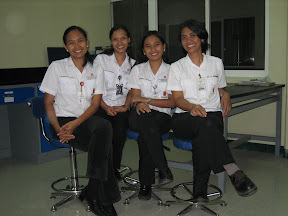 I can't find any photos from my first job so I am just going to post about my last job in the Philippines. I was a corporate slave then. Worked at a multi-national company in the beverage manufacturing. Work was hectic and demanded so much of my time because the plant is new, everything had to be commissioned and tons of product quality protocols had to be followed. I remember I had to stay at work for more than 24 hours on various occasions. But the best thing about working long hours is being able to bond with my colleagues from my department. I have made good friends with my fellow QAs then. Movie marathon at Em-Em's place. With Te Dang, Jhownie and Emerald. My QA Family. Nini was still pregnant here. 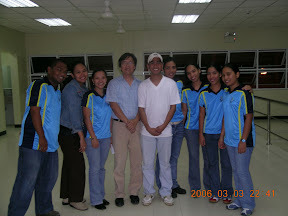 In our badminton uniforms during our 1st Badminton Tournament in 2006. 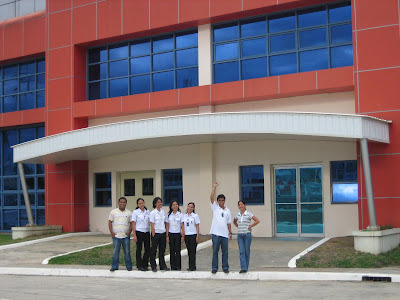 Sir Danny Tan was still the plant manager. With my QA family and other coworkers and bosses. It was my last official day at work. Those were such fond memories. I miss working in a corporate setting but I am happy where I am now. I am just thankful to have known and met them all. 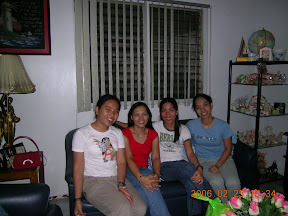 Thanks to email, Facebook, YM and Friendster, we still get to communicate every now and then. hello marce! sensya na di ako madalas makabisita. hirap maging breadwinner. hays. hihi. andami mo naman pictures with your coworkers. saya! kmi onti lng. bat ganun. hihi. teka nga andun ata sa fecebook ng boss ko. hahaha! dropping by as Niko's proxy. hihi. thanks for participating this week! mwah! sounds like a really cool job! Bdw, sorry for the late hop ha my entry is here. See u this Thursday with ur most recent picture with your offline friends! And thank you for joining GT!